Perth, Aug 24, 2011 (Global Fashion Wire) - The Third International Conference of Fashion Incubators will be held at the Parmelia Hilton in Perth, Western Australia from the 11th until the 13th of September 2011, and the Department of Export Promotion (DEP) of the Ministry of Commerce in Thailand has confirmed it will be exhibiting at the event. Thailand has a comprehensive fashion and textile industry, offering everything from upstream materials to downstream finished products. The products are renowned for the quality of production and design. Decades of production experience and a modern sense of style make Thailand an obvious location for foreign fashion business. 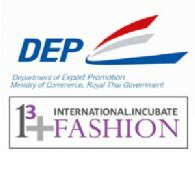 To assure that foreign traders have information accessibility, service and convenience necessary for sourcing materials or importing Thai products into their countries, the Department of Export Promotion (DEP) of the Ministry of Commerce serves as a link between Thai exporters and foreign buyers by providing its highly convenient service. Conference Convenor of the Third International Conference of Fashion Incubators Carol Hanlon said, "Those with a keen eye on prosperous business partnership in Asia, look to Thailand, and it is fantastic that they will be apart of the Third International Conference of Fashion Incubators in Perth next month."